Airbus has inaugurated Europe-U.S. transportation services with the Mobile Express, a new ship that carries major A320 Family jetliner subassemblies from the company’s European production network to the final assembly line in Mobile, Alabama. Beginning with an inaugural voyage in February, the Mobile Express is linking the industrial site in Saint-Nazaire, France with the Airbus U.S. Manufacturing Facility, located on the Mobile Aeroplex at Brookley, adjacent to the Gulf of Mexico. Crossing the Atlantic Ocean once per month, the Mobile Express carries such major A320 Family components as fuselage sections, wings and pylons, as well as vertical and horizontal stabilisers – helping to sustain the ramp-up of Airbus’ jetliner production in the U.S.
With a total load capacity of 5,600 tonnes and a length of 180 metres, the Mobile Express has a cruise speed of 19 knots (approximately 35 kilometres per hour). Built in Italy, it joins Airbus’ existing aquatic fleet of vessels that support the company’s production network. 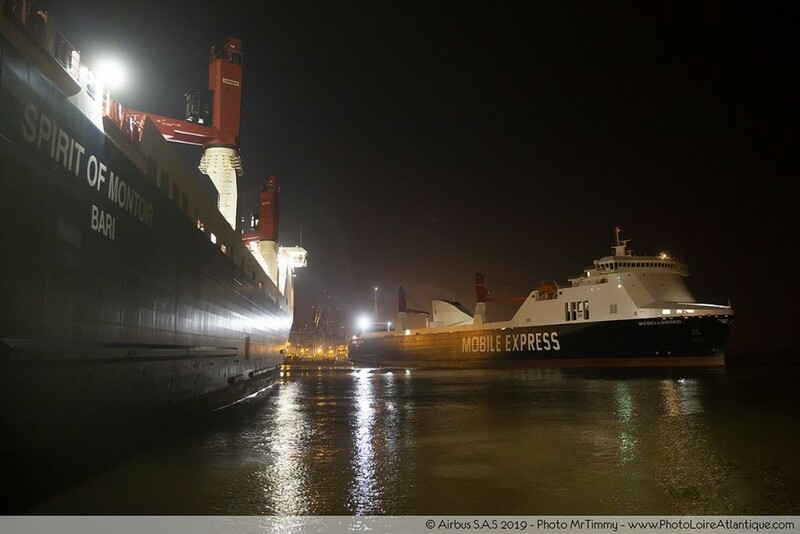 The Mobile Express’ name was chosen based on the contributions of more than 300 Airbus employees at Saint-Nazaire and Mobile, along with Airbus’ logistics and transport community and the ship’s owner. Airbus manufactures components for its aircraft families at different sites across Europe – with final assembly performed at locations on the European continent, in China and the U.S. To support this wide-ranging industrial footprint, major components are transported by sea, river road and air. This tailored system enables large, pre-assembled aircraft sections to be moved by Airbus’ customised, in-house transportation system. The Airbus U.S. Manufacturing Facility was opened in 2015 and builds the A319, A320 and A321 jetliner versions. It is situated on the Mobile Aeroplex at Brookley, where Airbus also has an engineering centre that specialises in cabin and cargo systems for aircraft across the company’s product line. Airbus’ industrial presence at Mobile took another important step earlier this year with the ground-breaking ceremony for a new final assembly line to build A220 jetliners. This operation results from Airbus’ partnership with Canadian-based Bombardier and Investissement Québec on the 100-150-seat A220 aircraft family.